My family received free admission to the Kennedy Space Center but all opinions expressed here are mine alone. 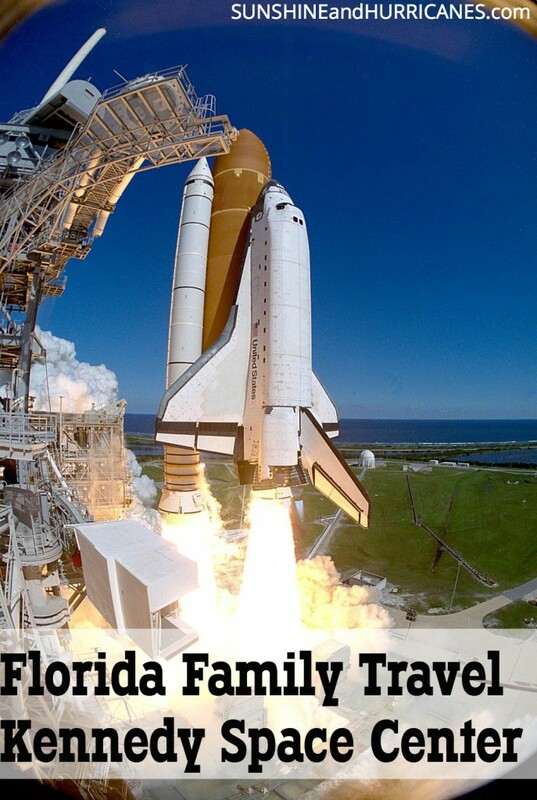 If you’re looking for adventure or a quick weekend getaway, this Florida Family Travel Kennedy Space Center experience is for you! 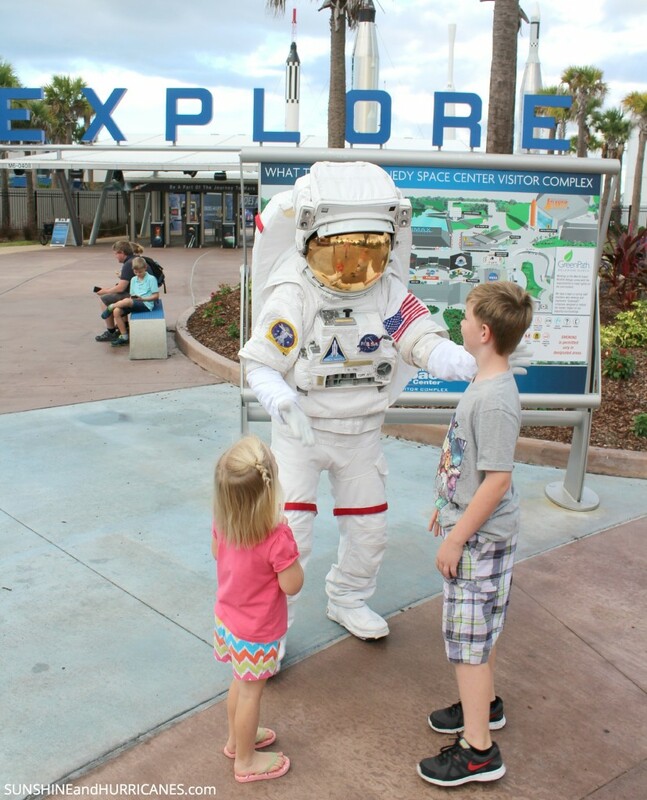 Full of learning and fun, families will enjoy the history, science, and hands on exhibits as they spend a fun filled day at the Space Center! 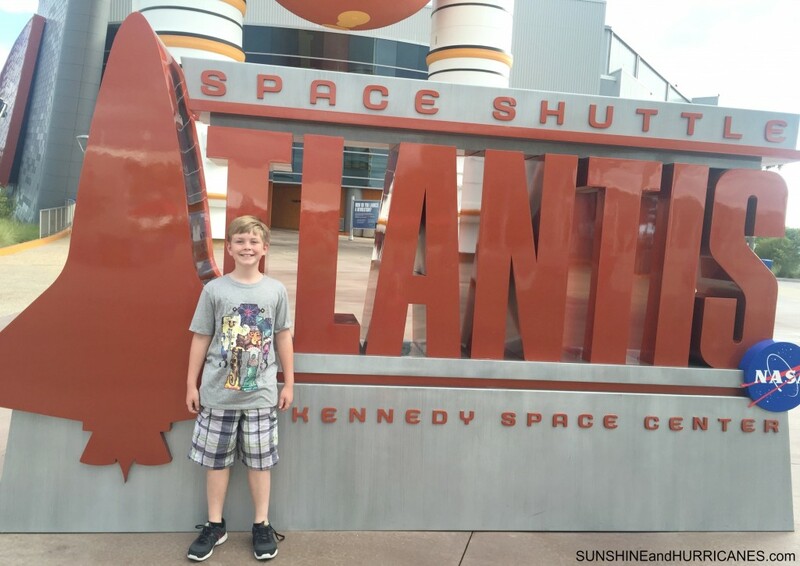 Our family recently visited the Kennedy Space Center and had an amazing experience! 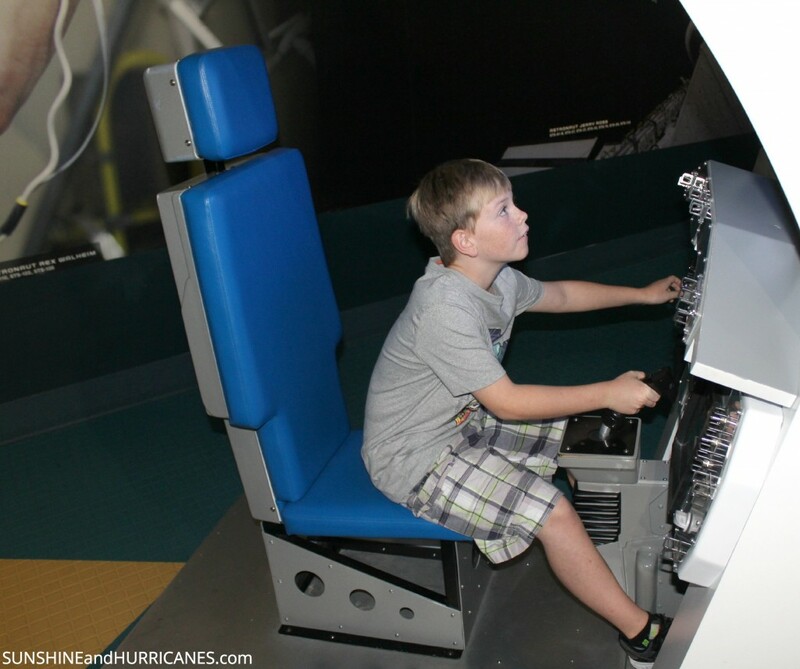 Located on the east coast of Florida and less than an hour from the Orlando area, the Space Center is a great way to incorporate education in an exciting, hands on way. My 10 year old son thought the entire place was “The coolest thing on earth!” and my 8 and 4 year old daughters were happy and entertained throughout the day. I was slightly concerned that my young daughters might be bored or uninterested throughout the day but I’m thrilled to say that was not at all the case! We arrived a few minutes before opening and enjoyed taking pictures and were then pleasantly greeted by the opening strains of The Star Spangled Banner promptly at 9am. Everything came to a halt and we spent a couple minutes gazing at the American flag, proudly blowing in the breeze. This patriotic tone continued throughout our visit. We started our day at the Atlantis building (towards the rear of the park)and I recommend starting yours there as well. The crowds headed to the attractions at the front of the park and by heading to the back, we were practically alone for over an hour in the Atlantis area. Getting to see the actual Atlantis shuttle up close was breathtaking. 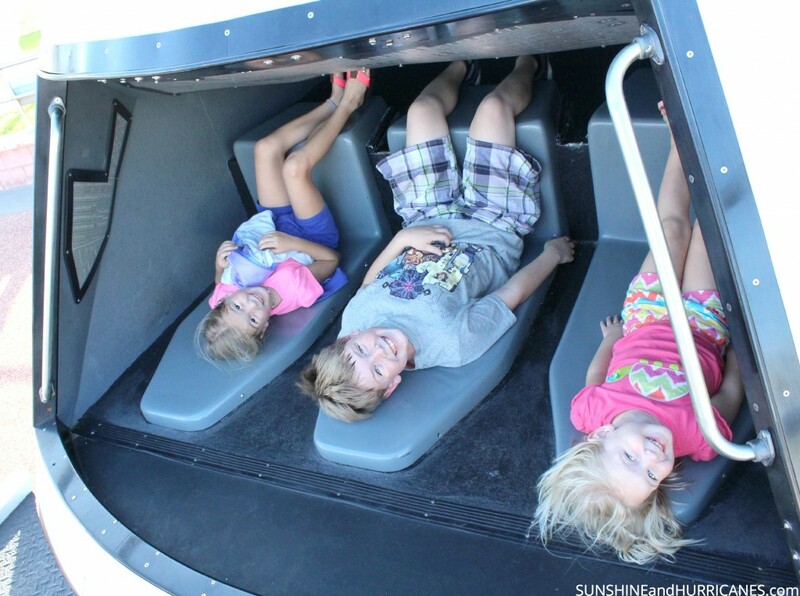 There were astronaut training simulators and plenty of other hands on fun to keep us occupied until we boarded the Shuttle Launch Experience. This unique experience is extremely similar to the simulator astronauts use for training and was developed exclusively for NASA. My husband and 2 older kids thought this was the highlight of their day. There is a height requirement for all passengers(min. 44″) and there is an option to skip the motion portion and simply watch the presentation if fast paced simulators aren’t your thing. After a quick lunch, we boarded the buses for our tour to the launchpads and visit to the Apollo/Saturn V building. I wasn’t sure what to expect from the bus tour but it was so educational and included an extensive tour of the Space Center property, including frequent stops to view wildlife. Make sure everyone uses the restroom before boarding the bus, it was about a 30-45 minute tour before we stopped at the Apollo/Saturn V area. This was definitely another highlight for us as we all were able to actually touch a piece of the moon(! ), see the immensity of the Saturn V rocket( so HUGE! ), and view a collection of spacesuits and memorabilia from various space flights. The 3D Imax movie, Rocket Garden, Children’s Space Dome(a super fun, covered, themed playground that all 3 of our kids ran crazy on and loved) and the Mars Exploration Space area were all amazing and interesting for our family. We also were able to meet astronaut Jack Lousma, which was a thrill for our son and a highlight of our visit. Growing up in Florida, I became accustomed to shuttle launches and seeing the spacecraft frequently in the sky, but standing just a few feet from Atlantis was a once in a lifetime experience. The thing that most surprised me about this trip was the immense feeling of patriotism I experienced. As I read biographies & memorials, I tried to comprehend the massive amount of work that it had taken to send astronauts into space. I was proud, so proud of these brave men and women that had risked, and paid, much to achieve what I’ve grown up taking for granted. As I watched my son’s awestruck face, I was grateful to have this time to share a part of history with him, to see him appreciate the sacrifices of others. 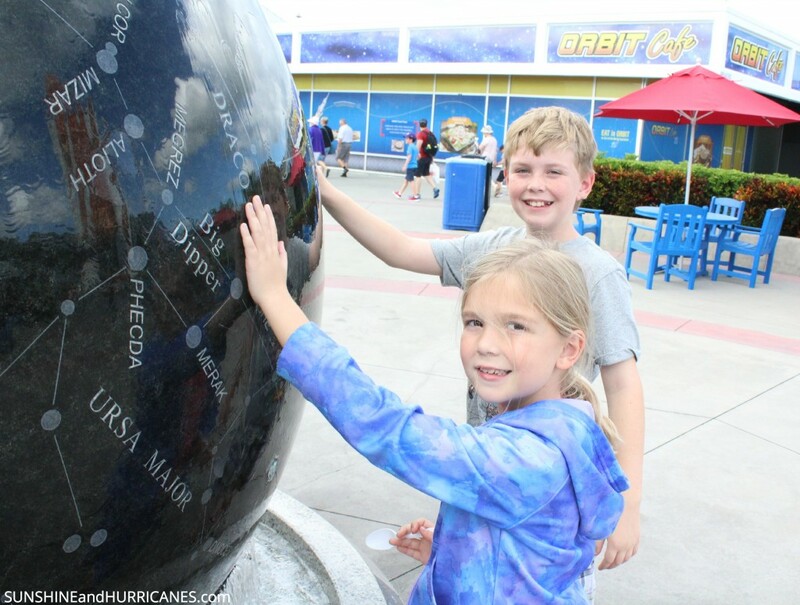 Need more ideas for exciting and educational attractions in Florida? We’ve got tons of ideas, from seeing live mermaids to searching for shark’s teeth! We’ve even got dozens of ideas for family fun in the Orlando area that don’t involve theme parks! Visit our Florida Family Travel page for more information! This looks like a lot of fun! I’ll have to remember to look it up the next time I’m in Florida. So fun! My kids would absolutely love this!!! Whata fun place to visit! 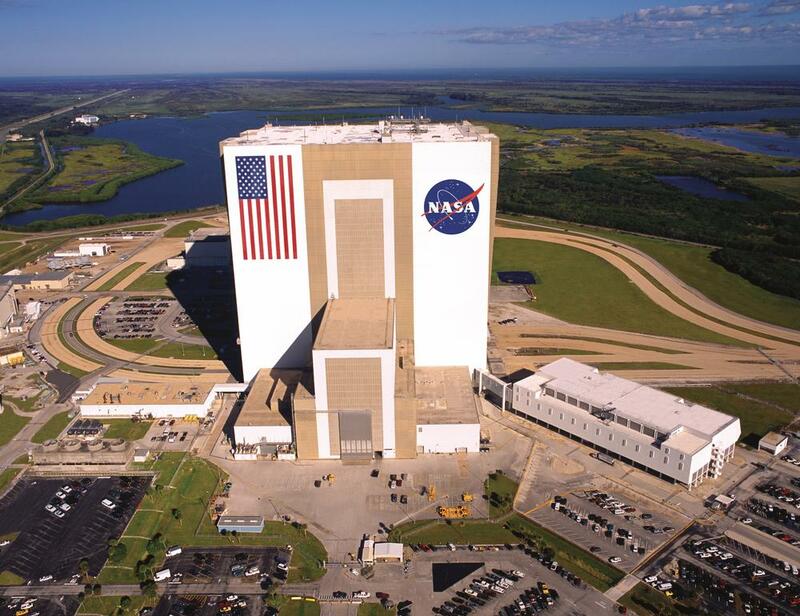 I’ve never been to the Kennedy Space Center, but I have been to the one in Houston, TX. I’m not sure if it’s as fun, but it is pretty fun! This looks like such a great trip! Glad you and your family had a great time! I have always wanted to bring the kids there. Hopefully, next year. I have never taken the time to go there and we visit my brother in Orlando often so it would not be that far. Must check int that. We love the Space Center! My mom grew up around there, so we go back to visit! This looks like so much fun! It seems like there is a lot for kids to touch and explore! My oldest son would absolutely adore visiting the space center! I definitely need to make sure to get him out there! This is one place I regret that we never visited while living in Orlando. We really missed out. I would love to visit the space center! We have the NASA space center here in Alabama and I have never even been to it. I will have to take my kids soon! My nephews would LOVE this, what a great idea for vacation! What a cool place to visit! I’m not a kid but I would love to go!